As the temperatures start to increase, so do the calls regarding dogs left unattended inside vehicles. On Thursday, May 18, when the highs reached 90°F here in Windham, Chris Costa from WCSH6 came out to the Windham Police Department to do an experiment regarding the potential dangers of keeping pets and kids inside of a vehicle during warm weather. We discovered that in just 15 minutes, the interior temperature of an SUV became over 100°F. Many people explain that they were “just running a quick errand” and sometimes they think they are taking the proper steps by parking in the shade, leaving water for their pets and cracking the windows but I am here to tell you that these steps are not enough to keep animals safe and comfortable. Dogs have a minimal amount of sweat glands so they must pant in order to cool themselves off. When breathing in warm, thick air, it is hard for dogs to create proper circulation in order to cool their bodies down. Leaving windows cracked also does not always allow for proper ventilation to adequately cool off the animal. 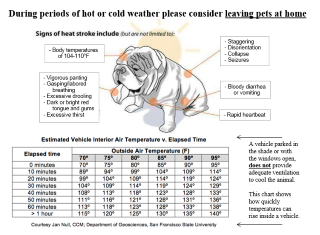 If any citizen witnesses a dog inside of a vehicle exhibiting signs of heat stroke including: vigorous panting, labored breathing, staggering, excessive drooling, excessive thirst and dark or bright red tongue and gums - they can call into dispatch (892-2525) and give the location and description of the vehicle, as well as the signs of distress that the dog is displaying. According to the State of Maine Animal Welfare Laws, only certain authorities such as a law enforcement officer, animal control officer, firefighter or licensed security guard are able to take actions to remove an animal if they appear to be in immediate danger. The person responsible for an animal may be found guilty of cruelty to animals if that person is found to have knowingly confined the animal to the car when extreme heat would be harmful to the health of the animal. A civil Cruelty to Animals charge includes a fine of not less than $500 and no more than $2,500 for a first violation, none of which may be suspended; along with possible additional penalties, including permanent relinquishment. If you think it could be too hot for your pet, please set a good example and leave them safely at home as the consequences could be catastrophic!